"You hold six doctorates, Sam. Medicine is just one of them. Your special gift was quantum physics. Time Magazine even called you the next Einstein. The truth is, if there's one guy who can figure out how to bring you back, it's you." Few TV shows truly take advantage of their medium. The design of most primetime sit-coms and dramas is to make each episode stand apart from the series as a whole, almost like a mini-movie. That's why a concept like Quantum Leap is still refreshing even though it has been nearly a decade since the show ended. Creator Donald P. Bellisario came up with an ingenious brainchild about time travel that feature films could never bring about. Quantum physicist Sam Beckett (Scott Bakula) is working on a top-secret project for the United States government. This project, if successful, will allow Sam to "leap" throughout time with his supercomputer, Ziggy, as a guide. Unfortunately, Sam decides to leap despite the system not being ready. Considering the intelligence of Sam�we later learn that he is basically the top scientific mind in the world�it is a bit of a puzzlement that he would do something as foolish as this. But thanks to Sam's rash behavior, television viewers are treated to some of the most fun and intelligent television programming of the late 1980s and early '90s. Quantum Leap: The Complete First Season presents all eight episodes, including the two-hour pilot, for fans of the series to enjoy. The series premiere, Genesis, is a special two-hour episode (well, if you include the commercials that normally would run with it) that begins with Sam not knowing what has happened. He wakes up to learn that he is an Air Force test pilot named Tom. The year is 1956 and Tom is one of the fastest pilots in the whole Air Force, but once Sam arrives things change. Sam doesn't know how to fly and can remember only fragments of his life. Fortunately, Al (Dean Stockwell), a former astronaut who appears to Sam as a hologram, explains how he can leap out of Tom's body. Al tells Sam Ziggy's theory about Sam needing to correct an error in history. According to Ziggy, once Sam has corrected this mistake he will be able to leap back to the experiment site. Out of desperation, Sam and Al give Ziggy's theory a try and learn that it is correct—for the most part. Instead of leaping back to the current day, Sam is stuck in limbo, going all across the country to right the wrongs of history. Thus is the drive of the show, with the viewer traveling alongside Sam into different situations and eras. The series wisely blends drama with comedy and has some nice "kisses" with history. In Star-Crossed, Sam, as Professor Bryant, re-unites with his lost love, Donna (Teri Hatcher), in 1972. This particular outing gives Sam a chance to save the life of one of Professor Bryant's students, help change Donna's hatred towards men, and unintentionally reveal some damaging information about the Nixon administration. Like the other introductory episodes to the series, this one is primarily light entertainment with good acting. The first five episodes of this season are a fun viewing experience, but do not offer much in the way of substance. Take How the Tess Was Won; the entire show is just an update of The Taming of the Shrew with a twist involving a music icon at the end. If it weren't for Scott Bakula's convincing performance as a man stuck in someone else's body and the impressive production values, these early episodes would be largely forgettable. But towards the end of the season, the writing and storytelling took a more serious tone. With The Color of Truth the series became a solid drama that offered subtle examinations of history and human nature. It is easily the best show of the first season, featuring Sam leaping into the body of Jesse, a black man in the deep South during 1955. Looking at this episode now, it will play very similar to Driving Miss Daisy, but it still works because the acting and writing are strong. As Jesse, Sam helps Miz Melny Trafford (Susan French), a rich widower, become a promoter of civil rights. There is no doubt that this episode simplifies the struggle blacks faced in having their rights recognized, but it honestly portrays both sides of the issue. Yet, the drama is not what made the show so popular. It is the fun of time traveling, however impossible such a thing might be, that got viewers to tune in week after week. The special effects look dated now, particularly the effects of Al walking through objects, but they still achieve their goal. 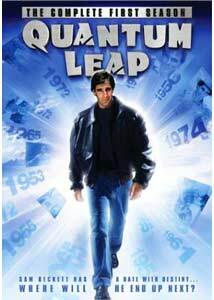 The first season of Quantum Leap is by far the weakest, since both the creators and audience were still adjusting to the concept of leaping. However, it led to three more seasons of fun and intelligent drama that consistently engaged television viewers. Image Transfer Review: The original aspect ratio of 1.33:1 is preserved with this set in a nonanamorphic transfer. The image is no different from the syndicated re-runs, which is a shame. Stock footage is easily noticeable in comparison to the other footage. How the Tess Was Won has some vibrant colors and the crispest image of all the episodes, but the age of the footage is apparent throughout the whole season, with print defects, scratches, and grain being noticeable all the way through. Audio Transfer Review: Presented in 2.0 Mono, the show defaults to Pro Logic with some nice sound separation and directionality. Genesis is easily the best mix of the whole set, with a dynamic presentation of the airplanes and sonic booms. The surround speakers and front sound stage are used well here, with sound effects and music creating an engrossing experience. The other episodes are by-the-numbers, with only music playing in the surround speakers and minor, infrequent sound separation. It's not a bad sound mix, but it's nothing exciting either. Quantum Knowledge: Episode Introductions—a few words from Scott Bakula prior to each episode about the filming of that particular show. Extras Review: Apart from a nifty Digipak with a fluorescent glow on the cover, the first season of Quantum Leap does not have very many extras. There is an option to play all of the episodes on a disc together, or else you can access the episodes from the Episode List. Quantum Knowledge: Episode Introductions can be played prior to each episode. Featuring Scott Bakula, these clips average to be about 90 seconds of him recalling specific stunts or details while filming the episode. Some of them are interesting, such as his recollection of The Color of Truth, while others are nothing much. The other extra for this set is A Kiss With History (20m:38s), a documentary on the making of the show. It features interviews with Bakula, Stockwell, and show creator Donald P. Bellisario. Their interviews are interspliced with relevant clips from the show. All three men talk about the joy of making the show, with Stockwell giving some interesting insight to his approach to acting Al (evidently, he chose to smoke cigars because it was an easy way to get them for free). The documentary is not very extensive, but it has some worthwhile elements that fans will like to see. Quantum Leap: The Complete First Season is worth a purchase. The packaging is nice and the sound is good when played in Pro Logic, but, on the downside, the image is no better than the syndicated re-runs on the Sci-Fi channel. The extras are not as extensive as other TV boxed sets, but the documentary provided here does contain some nice anecdotes that fans of the show will want to hear.